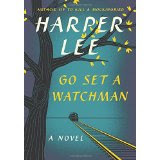 GO SET A WATCHMAN, the new/old book by Harper Lee. It was published this Tuesday by Harper Collins. I haven't read it yet and frankly I don't know if I want to. I find it very disturbing that a woman who guarded her privacy so fiercely and who shunned any kind of limelight is now a topic of universal discussion. A woman who never wrote another book in sixty years now decides to publish an unpolished prequel or sequel of her magnum opus. What disturbs me most was a quote I read that the publisher has never spoken with her directly, only with her lawyer. How is that right? How can they know that her wishes are being observed? We don't even know that she is mentally capable of making decisions. We don't even know if she was even asked. Isn't it more likely that her lawyer got his hands on an unfinished manuscript and decided to cash in on it?So what do other Reds and readers think about this? I would hate someone to find a first draft or early manuscript of mine and thus tarnish my reputation. I admit that the only facts I know are those I've read or heard on radio. So please set me straight if I am wrong. LUCY BURDETTE: I haven't been studying this carefully, but lots of the facts seem bothersome. I totally agree that I wouldn't want an old piece of work that I'd deemed unpublishable put out into the world. Gosh it's hard enough to feel like a finished manuscript is good enough. Because the recently published book is so "valuable", it certainly opens the process to accusations of exploitation. This reminds me of the struggle over Steig Larsson's unpublished work after his death. the stakes are very high in both cases. HANK PHILLIPPI RYAN: Jonathan is afraid to read it, because he doesn't want to ruin his vision of Atticus. And I talked to a person yesterday who was trying to explain to me how the change of Atticus's personality was a logical progression, envisioned through Scout's brain. And I think it's fascinating, because in reality, to an author, we are creating characters, and with the stroke of a pen or the delete button, the characteristics can change. I have certainly made a character I thought was good into a bad guy, and it is not difficult to do. But the good guy AND the bad guy can exist, just in different universes. One does not have to develop out of the other, or even be connected to the other, it's just a completely different character in a completely different story. It's not contradictory, it's just a different snapshot of a different time. It's not exactly the same, but it is kind of like the Wizard of Oz and Wicked. I am looking at it as an interesting insight into the author's process. And the editor's process! Jonathan, looking at it a different way, says it is terrible that the reputation of Atticus is getting ruined… For money. DEBORAH CROMBIE: Lucy, that's a very interesting piece by James Scott Bell. It made me wonder if it doesn't make Atticus Finch's defense of Tom Robinson in To Kill a Mockingbird more admirable, rather than less, when we know his political views. He upheld the law in spite of his opinions on race and segregation, which is what a lawyer should do, isn't it? I'd love to know what Jonathan thinks, Hank. Still, that doesn't make the older Atticus (from what I've read) any more appealing, but people are often both complicated and flawed. Will we ever have a definitive answer to "Should it have been published?" Probably not. Has anyone actually read it yet, and if so, what did you think? I, too, am concerned about all the stories floating around and would be quite dismayed if the book was indeed published without Harper Lee's approval. That said, I ignored all the folderol and read the book. It's moving and uncomfortable; it's filled with humor, pathos, love, joy, melancholy, heartache . . . the stuff of life itself. "Watchman" is Scout's bittersweet coming-of-age story and it seemed to me to be relevant both to the time period in which it occurs and to the characteristics and values of her father. Eight-year-old Scout’s hardscrabble 1930s Deep South life [in "To Kill a Mockingbird"] has morphed into Jean Louise’s adult world in which the burgeoning civil rights movement is taking hold. Atticus, once seen only through depthless childhood eyes, has become a more complex, more complete, multi-dimensional character. At seventy-two, he’s a man of the time in which he lives. And yet, [despite the segregationist views], in ways that matter, he remains essentially unchanged. “The law is what he lives by,” Uncle Jack tells Jean Louise. And, by setting aside his personal opinions and taking on Tom's defense, Atticus has firmly and quietly done what he believes to be the right thing. And in the end, isn't doing the right thing, despite our personal opinions, what it's all about? Yes, eager to see what everyone says, Joan, so happy you read it. Thanks…and thank you and Reine for your insight. Thank you. I have been deeply troubled about this from the start and have written several blog posts on the subject. I'm sorry to say that each new revelation about the "discovery" of this manuscript has done nothing to change my feelings. In fact, I'm more troubled than ever. Follow the money - for I am sure that money lies underneath all of this. To Kill a Mockingbird is my favorite novel. I therefore admit I am very protective of it and of Harper Lee's legacy. She never wanted to publish another book. She knew, somehow, that publicity and the expectations of an audience expecting another TKAM would be too much. Those who around her - family, friends, lawyer, publisher - should have protected her. They haven't, though some have tried. Instead, she's been victimized. And finally, the manuscript was discovered, according to her lawyer, after Lee's beloved elder sister who was also her lawyer, died. Too suspicious for words. Thanks for the discussion. I won't be reading Go Set a Watchman. According to reports, such as this WSJ article, Lee originally submitted WATCHMAN to an editor and received feedback that led her to revise the book into MOCKINGBIRD. That is what most dissuades me from reading WATCHMAN: It brings to mind the un-aired pilot of THE BIG BANG THEORY, which did not include Howard Wolowitz or Raj Koothrappali, and in which the female lead was Katie, described by creator Chuck Lorre as much more caustic than Penny. These differences are probably among the reasons that pilot didn't make it to air. There's no question money can be made from publishing first drafts of seminal books like MOCKINGBIRD. Lee could have capitalized with WATCHMAN years ago, but she chose not to let it see the light of day. Her apparent late change of heart is, at the very least, suspicious. Harper Lee apparently fired off a letter to refute the claim that this novel was being published without her consent. But, the fact is, she's in a care facility; her watchdog elder sister, who was her attorney, is dead; and no one has spoken directly with Ms. Lee. GSAW had a first run of several million copies, I believe, which translates into BIG MONEY. Who profits? Now, imagine a different scenario: suppose Ms. Lee had passed away and her papers were willed to a university. In the process of cataloging those papers, this manuscript would have certainly come to light. Big news flash: another novel by Harper Lee! The end result, I think, would have been the same--the novel would have been published with a lengthy foreword by the lucky professor who got his/her hands on the manuscript first. As it stands, I will read it eventually because it was Harper Lee's first novel. As I understand it, her editor suggested that it might be interesting to write a story from the young Scout's point of view, since the now-adult Scout has come home and is remembering scenes from her youth in GSAW. I want to see the evolutionary basis, if you will, that allowed her to produce TKAM. Nothing will ever change about the power of To Kill A Mockingbird--it deserves to stand as one of the greatest novels of American literature. I have resented somewhat the reports about Ms. Lee being perhaps not of sound mind because she's hard of hearing and no longer sees well. The Alabama Dept. of Social Services (or whatever the proper name of such organization is) has done extensive investigating into the matters of abuse concerning her, found her to still be a capable woman albeit with diminished hearing and sight. They have declared the facility where she resides to be in no way an abusive environment. I'm also willing to give the attorney the benefit of the doubt. She has been a part of the family for many years and I wonder if perhaps some of the folk in Monroeville who claim Ms. Lee as their own are truly as close to or as knowledgeable as they declare. Ms. Lee does still have some family members there - they seem to be appropriately, I think, quiet regarding Nelle Harper Lee and her decisions. I've also been surprised by how many people have dismissed the book outright before actually reading it. I have read it and found it to be quite powerful in places. As far as Atticus. Being a southener, I found his persona depicted in the new book to be spot on for a man living where, when and how he lived. Not all the reviews written have been negative. And what, after all, is a review except another person's opinion? I was just in a discussion about this with a coworker yesterday. He and I were both of the same mindset, which is much like Gerald's above. It just feels unfair and unkind to me to read an earlier draft of any author's published work. It is the fact that it was submitted for publication, and revised to become To Kill a Mockingbird, that most dissuades me from reading it. Lee may or may not have made an informed choice to publish it, and those around her may or may not have had her best interests in mind. I don't know the truth around that, so I opt to sit this one out. So here's my confession. I've never read Mockingbird. I have seen the movie and a play version (actually saw the play first), but I've never read the book. I can certainly see why so many people love it, however. So maybe I'm watching this all unfold with less passionate eyes than many others. But I am curious. I'm curious how people who have loved the book for so long and read it with an open mind are reacting. It looks like there are some who are enjoying it. Others are hating it. That's about what I expected. I'm also very interested in how we got this book. Maybe she did decide to release it now for whatever reason. But the mystery reader in me is too suspicious and wonders if maybe her legacy is being taken advantage of. Unfortunately, unlike a mystery novel, we may never know. "And what, after all, is a review except another person's opinion?" My less than stellar opinion of a book may be more about me than the writing. So, I adhere to the Bambi school of thought: If you can't say something nice, don't say anything at all. I probably won't read the new publication because I do not like over-hyped books. Although I admit that on occasion I'll read one in order to talk knowledgeably about it. The author is still alive but I am posing a purely for-discussion thought: ethically (if ethics need to be brought into it) is publishing something like this -- that was not meant to be published originally -- different from collections of letters and diaries? TO KILL A MOCKINGBIRD was from the point of view of a little girl who was not aware of the nuances of the time/place in which she lived. Little girls idealize their daddies. Readers/movie audiences idealize their heroes. MOCKINGBIRD only shows the characters in a small slice of their Southern lives in the 1930s. What is on display in this book is the legal integrity of a lawyer. Do we really get to see his character beyond that? Nope. Judge Taylor appoints Atticus to defend Tom Robinson; Atticus didn't volunteer. He did his job as a lawyer. The controversy going on today IS a controversy because some people have attached an agenda to it. Up until about a year ago, if you'd asked me for a list of my all-time favorite books, I would have listed "To Kill A Mockingbird" somewhere in the first five. I'd read it first as a freshman in college, then again as a young adult, maybe once again thereafter, but not again for the last 30 years or so. Then, for whatever reason, I decided to read it again several months ago -- and almost couldn't finish it. Wow! What did I see in it, before? What was I thinking? To me now, it seemed overly simplistic, maybe nice for junior high, but nothing that would challenge or even interest an adult mind. I think what I liked -- what I thought I'd liked back then -- was an image I'd made up in my mind: my father, whom I adored, was a small-town lawyer, had a somewhat similar philosophical bent as did Atticus, a man who would similarly run "against the grain" of local thought, if he believed everyone else was wrong. Which he did. Quite frequently. So I think I was projecting my love for my father unto Atticus Finch, and therefore thought I "loved" the book. In rereading it as an adult, a lawyer for almost 50 years myself, I wasn't encumbered by my rather childish view of the world, or of Atticus -- or of my father, for that matter. On at least some matters, I'm no longer looking through the glass darkly. So now, will I read "Watchman"? No -- probably not. But not because of this new revelation about Atticus -- I could deal with that. But now I'm not really interested because I no longer see much merit in the first book. Some people enjoy reading "young adult" literature, I'm not one of them. But the real reason is, there isn't enough time to read all the books I want to read anyway, I can't imagine I'd seek this one out. But my decision is based purely on perceived literary merit, not on issues of what Atticus really was. Or wasn't. I am with you, Rhys. It disturbs me greatly that this book has come out now, at a time when I'm not sure that Harper Lee can adequately speak for herself. The other question that troubles me is if this lawyer is her literary executor. If she is, then she could well have brought out the book after Lee's death. What's the motive in doing it now? To get the appearance of a stamp of approval on what the the future literary executor knew would be a problematic situation? I haven't decided whether or not to read it. I probably will because I read everything I can get my Kindle on, but I am so torn about this. I probably will not read "Go Set a Watchman." I haven't ruled it out entirely, but probably 80-20 I won't read it. I did reread TKaM when it had its anniversary a few years ago, and I loved it as much the second time. The movie concentrated on the courtroom and Tom Robinson's case. The book is more about Scout's thoughts and the town and time of her early years. It is one of my favorite books and I was an English teacher for 34 years, so I have read a long list of books over the years. I am choosing not to read the sequel for precisely what is happening on this blog. If no publicity is bad publicity, it seems to me that by releasing the horrible revelations about Atticus in his later years, the people who will profit from this book have accomplished their purpose. Everyone is talking, texting, and commenting on what to do. What better way to enhance the bottom line? "Don't be afraid of 'Go Set A Watchman.' It's a draft of what became a singular novel, but it has its own charms blended in with some preachy, clunky, and un-PC situations. You can see Lee struggling with themes, characters, and focus. And you can see why her editor told her to take the stories of the younger children and expand them; some of the new bits involving the younger Scout, Jem, and Dill are very good. "Those with a serious case of Atticus worship will not be pleased. But Lee was going after something else entirely with this book and, despite it not being the technically-polished gem of TKAM, it's worth reading, and definitely holds up a mirror to those of us now fighting the battle for LGBT equality, and in that light its timeliness is eerie." Now, I share Rhys's concerns about how the book was published. As writers, however, we crave insights into other writers' process, and this book gives us insight into where Harper Lee started. The book has its charms (the flashbacks to childhood) and its flaws, particularly the stilted dialog (one reviewer likened it to Ayn Rand's style) that turns the speakers into positions rather than characters. But I'm thankful that I got the chance to see Lee's mind at work wrestling with her conscience, and changing the theme of the novel from a young woman trying to distance herself from her home town (and its values) to a much more nuanced multilayered story about racism and tolerance with significantly greater authorial control and technical skill. IT'S NOT A SEQUEL...so its characterization of Atticus is only a trial balloon, one that Lee rejected. I wish we could have clarity about what Harper Lee really wants, but I suspect we will be denied that. I enjoyed the book, but it doesn't tarnish my love for To Kill a Mockingbird in any way.